Dodge Brand new Transponder Key Blank. 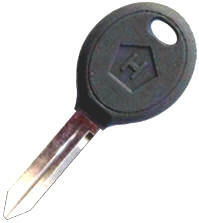 This key had a transponder key will fit all Dodge RAM pickup trucks 2004-2006. Simply have cut to fit your existing key. *Must be programmed by your local Dodge Dealer. 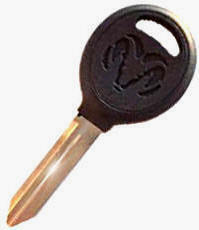 Dodge Brand new Factory Key Blank with RAM's Head Logo. 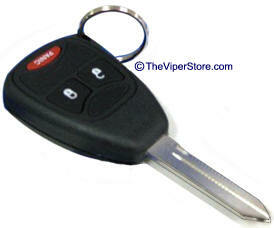 This non-transponder key will fit all Dodge RAM pickup trucks 2004-2006. These are genuine, new factory remote transmitters, not imitations or copies. Same ones the dealer would sell you. Chrysler part number: 04686481 AC. BRAND NEW remote transmitters that fit 2002 - 2005 Dodge Ram pickups with the factory remote keyless entry system. Your vehicle must already have the factory remote keyless entry system option on it for these remotes to work. Key must be programmed to work with your vehicle. If you already have a working remote, you can program it yourself with the included instructions. You can have up to 4 remotes on your vehicle. Must be programmed by your local Dodge Dealer. These are genuine, new factory remote transmitters, not imitations or copies. Same ones the dealer would sell you. Chrysler part number: 05175786AB. BRAND NEW remote transmitters that fit 2006 Dodge Ram pickups with the factory remote keyless entry system.